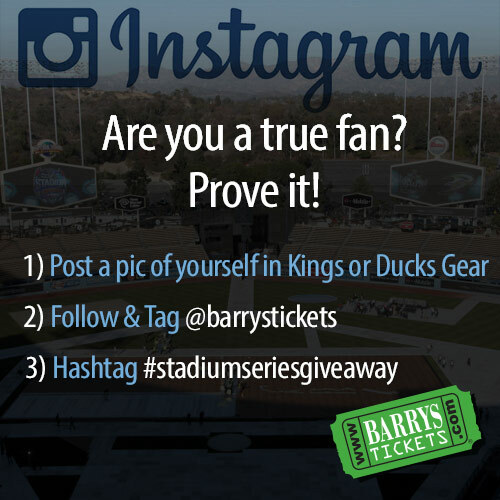 With just seven days left till the Los Angeles history making event of the LA Kings Vs Anaheim Ducks Stadium Series game at Dodger Stadium Barry’s Ticket Service is offering an exclusive giveaway of Stadium Series Tickets to our followers on Instagram! As the NHL Point leading Anaheim head into the final week before the Stadium Series game on Jan 25th they have two home games at the Honda Center. They face the Winnipeg Jets on Jan 21st for their second meeting of the season, in the first meeting on October 6th they defeated the Jets 3-2 in Winnipeg. Their only other home game of the week is a preview of what will come on Saturday when the LA Kings travel accross town to face them at the Honda Center on January 23rd in a game that is sure to set the tempo for Saturday. Ducks Tickets for all games at the Honda Center are available now. The LA Kings on the other hand will be finishing up their road trip. With a loss last night to the Red Wings the Kings need to regroup quickly to face another tough game when they play the Boston Bruins on Monday Jan 20 and Tuesday the Columbus Blue Jacks. After back to back games they fly back to the west coast to face the league leading Anaheim Ducks at the Honda Center on January 23rd. Then its on to the history Stadium Series game at Dodger Stadium against the Ducks on January 25th. Kings Tickets for all home and away games are available now. 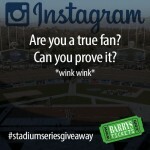 Exclusive Instagram Followers Stadium Series Tickets Giveaway! That’s It! You will be entered into our Giveaway! No Purchase Necessary! Only one picture per Instagram user will be accepted! If multiple pictures by the same user are tagged you will be disqualified. Rules: This contest is only for Instagram! No other social media site entries for this contest will be accepted! Only one picture per Instagram user will be accepted! If multiple pictures by the same user are tagged you will be disqualified. No Entries will be accepted after 11:00pm pst Monday January 20th 2014! Entries will be verified and a winner will be notified as well as the name of the winner posted here on Tuesday Jan 21 before 5:00pm pst! Verification: The picture MUST be of you in your Kings or Ducks Gear! If contestant does not match the tagged picture the tickets will be forfeited. If you show a picture of a tattoo and win be prepared to show the tattoo when you pick up the tickets from our office. Recieving the Tickets: Winner must pick up the Stadium Series Tickets from any one of our three offices on Saturday June 25th and show a valid ID. No exceptions will be made. Only the winner of the tickets can pick up the tickets they cannot be transferred into another name or picked up by anyone else. Contest does not include Lodging or Transportation to and from Dodger Stadium! A complete list of rules and regulations are available here. Barry’s Ticket Service reserves the right to change, edit or cancel this contest at anytime! You can purchase Stadium Series Tickets today. Good Luck To All By:Chris Michaels. 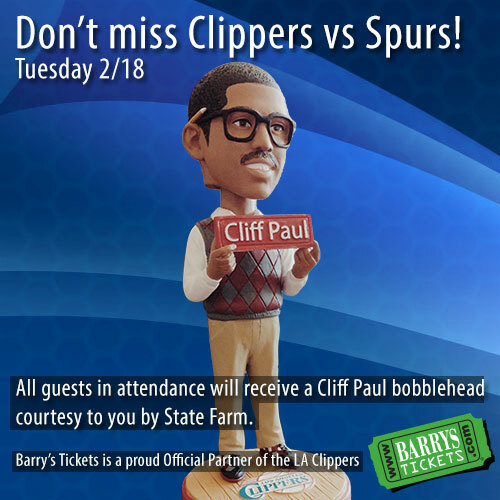 Barry’s Ticket Service is not affiliated with the NHL, Los Angeles Kings, Anaheim Ducks or Dodger Stadium.